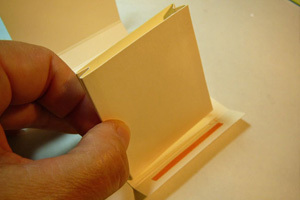 Create a card shaped like a matchbook. 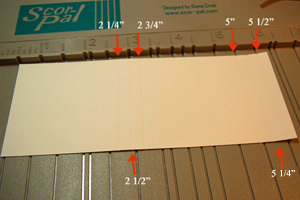 Score a 5 3/4" x 2 3/8" piece of cardstock at 2 1/4", 2 1/2", 2 3/4", 5", 5 1/4", and 5 1/2". Make mountain and valley folds as shown and adhere. This is the pocket insert. 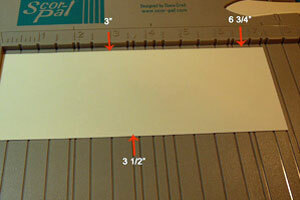 Score the 7 3/8" x 2 3/4" piece of cardstock at 3", 3 1/2", and 6 3/4". 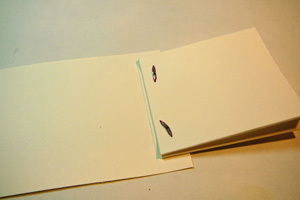 Make your folds to the outside, add the pocket insert and fold over the small flap. You could use decorative staples to secure the pocket at this point instead of adding the brads, if you would like. 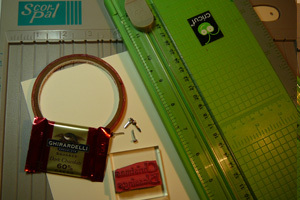 Add a narrow piece of tape to the 1/2" flap and place the pocket insert as shown and adhere the flap to the insert. 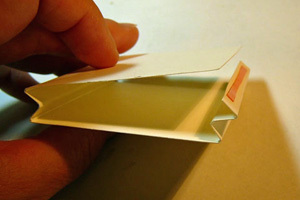 Avoid applying adhesive close to the edge or the top flap won’t be able to tuck inside when the project is completed. After adhering the insert, open the matchbook up and pierce for brad placement. Turn it over and spread the prongs of your brads. Add some adhesive tape over the brad prongs and press back into place. 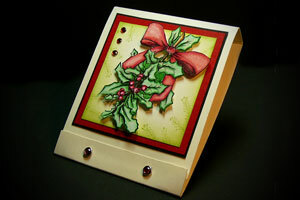 Add stamped layers and embellish the inside as desired. Card stock cut to 2" x 1 3/4" will fit perfectly on the inside. Decorate your matchbook holder. 2 1/2" card stock squares will fit the front. You've seen the tutorial, now you try it! We've got a section of the gallery set aside for Matchbook Candy Holder. Try this technique, then upload your artwork to the gallery. Show us your creations! super cute! I'm going to give this a try. Thanks for sharing! Great tutorial, however I can't see the video. Message states: "This is a private video. If you have been sent this video, please make sure you accept the sender's friend request." Dog gone it!!! I didn't plan on doing any more projects until I finished a few already in progress. However, these are wayyyy too cute to not make! Here I go.....Thanks for sharing. Great tutorial and awesome project! Love it. LOOOOOVE IT....super cute and looks relatively easy....definitely on my to-do list for co-workers! TFS! Thanks for sharing! I can't wait to try this! This is adorable! Small enough to make in multiples, yet with that personal touch. Thanks so much for sharing it! Oh my goodness Theresa this is fabulous! I LOVE the video - how about a sponging video! (LOL) Truly a cute project and I'm all about cute and inexpensive ways to recognize people. LOVE IT! Thanks for sharing. Wonderful video, Theresa. 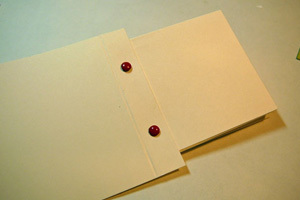 I have made these match books before but never with an insert - ingenious ! Thats a very cool idea. I never seen that before. Thanks for the tutorial. Way too cute. Hadn't planned on doing any more project, but will need to try this one. This a really cute project and great for times when you want to give a little something - e.g. get together with the girls for lunch, co-workers, etc. Great video. Lining up the scores a bit confusing but I'm sure I'll figure it out. Can't wait to try these. I was so inspired by this tutorial that I made 17 to give out to my co workers at Christmas. Some thought they were so cute that they were going to hang them on there Xmas tree. Great Idea!! Always looking for little "treat" holders for my kids to share with friends at school and church! Thanks! Cute! Great little stocking stuffer or party treat. What a great idea! The directions are so clear. I can't wait to make some!! I just came across this and really want to make one for my granddaughter. 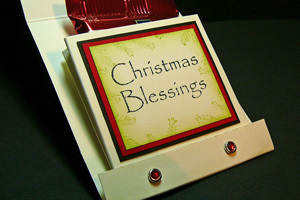 I would also like to know if there are directions for a full size card as I would like to tuck a small gift into the holder. I want to do this for Valentine's Day, so time is of the essence. Thanks so much for your help.